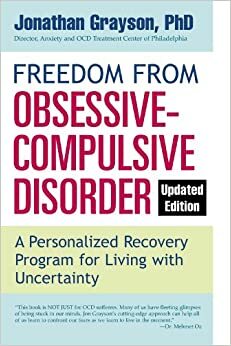 Freedom From OCD, by Jonathon Grayson, PH.D.
A personalized recovery program for living with uncertainty. Welcome to the Freedom from OCD website. The prime purpose of this site is to provide checklists and forms found in Freedom from Obsessive Compulsive Disorder. There is no charge for the forms or any of the material on this site. I want you to feel free to share them as you see fit, but I would appreciate it if you would credit me if you do distribute them. This website is broken into three sections. The first section is made up of the forms that are included in the book. There is a brief description of the forms and you may download them individually or you can download all of them at once via the download all forms button. The second section provides the user with articles relevant to my book and OCD. At this time, there are two entries in this section. The first is the GOAL manual, an in depth description of how to start and run an OCD GOAL support group. I do think it is useful for users to have read my book if they are going to run a group, but it is not essential. Additional information on GOAL can be found on my practice website, LAOCDTreatment.com under the Free Support Group heading. The second article in section 2 article is an expanded version of the 13 excuse modes for giving into OCD found in Chapter 15 of my book. These are the lies you tell yourself when you slip. The final section is an experiment. I am providing sample mp3’s that would be useful in therapy. At this time the chewing.mp3 is an exposure recording for those with Sensory Focused OCD (SF-OCD) in which the obsession is upon the sound of gum chewing. Over time I hope to create a library of usable mp3’s.